Audi’s most celebrated model, ‘Q7’ has eventually shed its old skin to get into new attire. Embodying numerous overhauls, the premium SUV looks fresh, leaner and newer. The emphasis on newer clearly hints at the dissimilarity between current model and its predecessor. With almost all areas being revised, Audi has not left any parameter untouched. One of the most prominent changes made to the SUV is the trimmed dimensions that said, the length, width and height have been sliced considerably. Use of new components and a much lighter chassis courtesy MLB 2 platform has skimmed a substantial amount of weight from the new Q7. Styling changes on the exteriors blend with the leaner body. Most of the revamp job is done on front profile, with apt styling make over bestowed on side and rear. 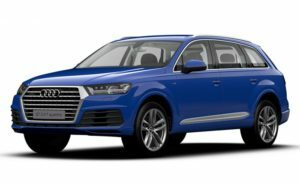 Tweaks made are extended to interiors too, implying Audi’s intent to endow Q7’s cabin with the best of what it can offer. Addition of new elements in the cabin lend an all new look, a couple of new features and an all new cockpit along with much spacious third row makes do for the chopped dimensions. Engine set up remains intact but there is a change in the state of power produced. The 3.0 litre, V6 diesel powerplant, eight-speed torque converter automatic gearbox and Audi’s Quattro all-wheel drive system continue fulfilling mechanical duties. The boost in power output on the other hand works in favour of Q7, pumping up performance. The new edition is not just a smarter version but it is tuned to offer better off-road driving experience.